Our product range includes a wide range of bridal sarees, bollywood embroidery saree, embroidered sarees, embroidery full sarees and embroidery work sarees. 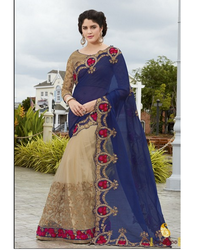 We are veteran manufacturer, supplier and exporter of Premium EMBROIDERED Sarees in Ahmedabad, Surat - Gujarat, India. New festive designer collection pure handloom rich Bridal Sarees with traditional. Our offered saree is designed from high-grade fabric under the strict supervision of our quality analysts. With the aid of our trained professionals, we are engrossed in providing an extensive range of top quality Bollywood Embroidery Saree. Capitalising on our sophisticated designing setup, we are engrossed in manufacturing, exporting and supplying a premium quality Embroidered Sarees. This saree is designed by our adroit designers using the best quality fabric with the aid of the ultra-modern machine. Our offered saree is designed from high-grade fabric under the strict supervision of our quality analysts. With the help of artistic team, we are capable to offer elite collection of gracefully designed Embroidery Full Sarees. We are offering Embroidery Work Sarees, Our offered saree is designed from high-grade fabric under the strict supervision of our quality analysts. With the help of the artistic team, we are capable to offer an elite collection of gracefully designed Embroidery Work On Sarees.